Hi, How did you get to the bottom of the bottom of the board to de-solder/solder in the new batt? I have my DP/Pro open now but can’t get the board out. Mostly due to the XLR jacks and the extension on the input level knob–not sure how that comes apart. Thanks! never mind, finally got it. Hopefully it will go back together ok! I removed the battery from topside – the board looked too messy to disassemble.It wasn’t necessary – I just touched my soldering iron off the battery legs and pulled it out. I replaced it with a standard coin battery holder by simply re-heated the existing solder blobs and pushed the holder in. Now the battery (BR2330) can be changed in future without the need for an iron. i just got a DP/4+ which needs a new power board (hopefully thats all). Once i have it working, i’ll see if I can compare to DP Pro. hi, i have brought the DP/4+ back to life. It looks like someone tried to change the converters and it blew the transistors and caused track damage to the PCB. Preliminary views; it sounds fuller and bigger than the DP/pro. The presets are definitely more exotic. I need to test the reverbs out and I think the DP/pro is quieter with a better analog section. Still exploring and i need to finish fixing this thing. Sorry to hear of your DPpro troubles. I have been intrigued by the DP4+ also but I can’t justify the purchase right now. TBH I haven’t touched my gear in some time as I recently started a business and it sucked-up most of my 2012 time. However I did treat myself to a new mixer for christmas and I have some spare time over the coming weeks so I’ll be working with the DPpro and reveal any findings/examples. hi, let me know where you get with your DP/Pro. I also picked-up a DP/4 (problem-free luckily) and I agree – I much prefer the sound of the DP4 over the DPpro. The reverbs have a nice gritty edge, and I also am loving the distortion – one of the best digital distortions I’ve heard. I understand now why this unit was so popular with the techno crowd. I may sell the DP pro. It’s a pain to program it. I only use it for chorus really. – The reverbs have a nice gritty edge, and I also am loving the distortion – one of the best digital distortions I’ve heard. I understand now why this unit was so popular with the techno crowd. Agree and its got Daft Punk all over it including their Tron release and anything else from their stable, i’m thinking Kavinsky’s outrun. – I may sell the DP pro. It’s a pain to program it. I only use it for chorus really. May do the same. Now that i have had more a play on the units and studied the schematics some more (i know), i think i know why the DP4 sounds better. There is gain staging and summing going on inside the unit, hence all those Op-Amps, whereas with the DP/pro I think it goes A/D and D/A pretty much. The Dp/Pro can sound cleaner but for keyboards and guitars the DP4+ is much better especially as you can chain 4 fx blocks. Its the closest you will get to eventide without breaking the bank. The algorithms are different and the DP4+ is much closer to the Lexicon 224. I do want to pick up a SPX2000 so the DP/pro may go. Also i need to save for the Oto fx devices which are on the way for Q4. By the way people complain the DP4 is noisy but i don’t think its that noisy or at least its noisy in a good way. Yup, mine’s bruised and beaten, but not noisy at all. I think you’re going a little deep on the theory for me. In the DP/Pro I was looking for decent quality configurable small-room reverbs on the send bus. I think I have that. In particular I like the reflection modeler a lot – it seems to give me the best results so far, and it’s easy to go out of the park. But I’ve spent most of my time recently making resonators. I.e feeding a medium delay onto a multi-tap with very short delay times. Feeding it the thinnest of noise impulses has produced Interesting and unexpected results so far. 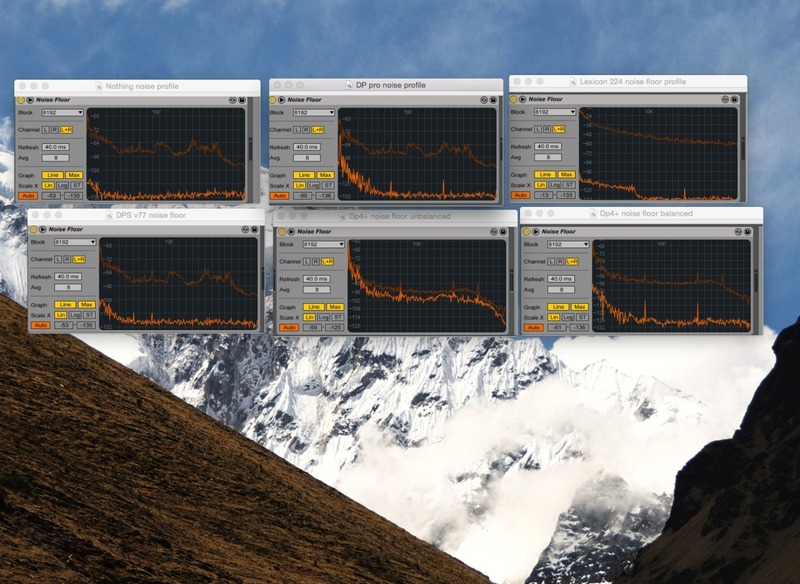 I’ll make some recordings…..
Have a look at these noise floor profiles. With balanced cables the Dp4+ is not noisy compared to other FX units. Hey, i have 3 DP4+s right now, having received 2 units to repair. Both had Bad DC Offset and one had a shut down channel. I now a great deal more about how to fix these units and the values you need to see at various test points. Will be publishing a write up soon. Separately, I have a DP2 on the bench and note it has a delta-sigma DAC so it will have a very different sound to the DP4 and the Dp/pro. I’m thinking it will be more like an Effectron. I have dp2 and dp/pro and they have similar sound. Dp/pro is easier to program. Dp/pro make some small click on the right channel. Do you have advices about it?